Apple’s last quarter’s sales growth was an impressive 83%. It was not as high as the 92% earnings rise because there was a higher mix of iPhones this quarter than in the past. The iPhone is the most profitable product in Apple’s portfolio so it impacts the gross margin significantly. The iPhone is, in fact, a huge part of Apple’s business. In units it reached 5% global share and 14% US share. I’ll go over the overall industry data as soon as all the major reports are in, but already it has been estimated that Apple is the largest phone vendor by profit and sales. The following chart shows the same information as shares of total net sales. I’ve read that some of the uncertainty around Apple’s future prospects is driven by the perceived vulnerability of these new blockbuster iOS products. At first glance this growth looks quite unprecedented and hence risky. 65% of sales from iOS did not exist four years ago. If you look at the sector it’s hard to find any company that has doubled its sales in a few years from completely new product lines. Especially a mature company over 40 years in the business. 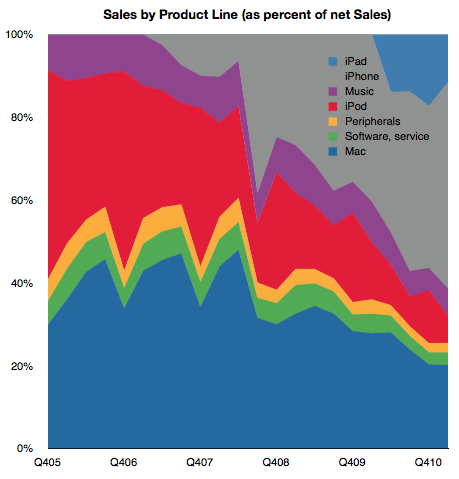 If you look again at the second chart above, you’ll note that the proportion of sales held by iOS devices has mostly replaced the sales share that used to be held by iPod, itself a product that did not exist four years prior to the time of these charts. 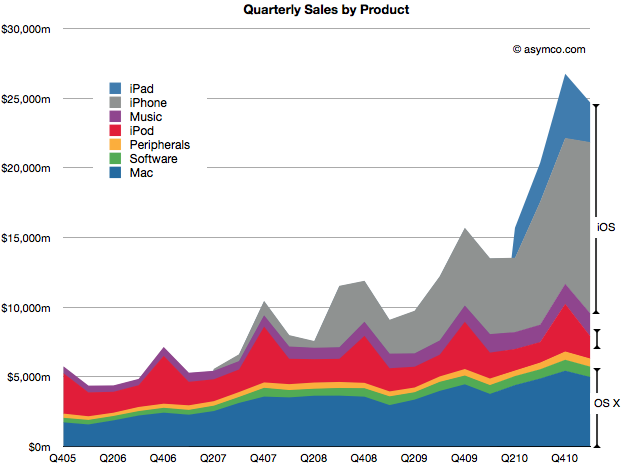 Apple consistently doubled its sales on the basis of the iPod. It’s now consistently doubling on the basis of iOS. Exceptional claims require exceptional evidence. But that’s exactly what the investment thesis for Apple should be: Exceptional growth is no exception. Even this exceptionalism is not unique. It happens not just at Apple, but at another of Jobs’ creations: Pixar. Perhaps this magic formula for exceptionalism is itself a fluke but what if it’s not. What if blockbusters are really something that can be built with repeatable consistency. What would that be worth?